Barbados has a long tradition of commercial banking, both in a formal sense in terms of international banking institutions and, in a more informal sense, by way of credit unions and provident societies. Commercial bank development has reflected the growth and focus of the island’s trade relations. In addition to commercial banks, there are regional and local development institutions that are primarily geared towards long-term lending in some cases, and in others to the financing of risks that are sometimes more development-oriented than commercially attractive. The Caribbean Development Bank is a regional institution, headquartered in Barbados, and is in the business of financing development to its member countries. The Inter-American Development Bank, another regional institution, is also headquartered in Barbados and has a wider membership encompassing the hemisphere of the Americas. Its loan portfolio is larger and more diversified, and its terms of repayment extend longer than its Caribbean counterpart. Barbados is also well served by a variety of well-organised and efficiently managed credit unions and provident societies whose activities are restricted to their members, and whose actions are governed by relevant applicable cooperatives legislation. Offshore banking in Barbados was introduced in 1979 by virtue of the Offshore Banking Act (OBA), now repealed and replaced by the International Financial Services Act (IFSA), with the Central Bank of Barbados (CBB) in charge of the general administration of the Act and the Minister of Finance responsible for the issuing of licences. The Act stipulates that a licence may only be issued to an eligible company or a qualified foreign bank engaged in foreign-sourced banking or trust activities. The establishment of the CBB eliminated the need for external monetary regulation and management by the East Caribbean Currency Authority, thus promoting national autonomy. Unlike a commercial bank, the CBB does not offer public banking services. Rather, the CBB works with the government to create sound monetary and fiscal policies that promote development and maintain public confidence in the economy. The CBB is committed to promoting monetary stability, creating a sound financial structure, strong monetary and capital markets, and the investment of commercial bank credit into productive activities. In seeking to safeguard the integrity of the financial system, it has two key objectives: to regulate and monitor the financial environment, and to provide a stable monetary framework and sound financial structure. The Bank Supervision Department of the CBB is responsible for regulating and supervising commercial banks and international (offshore) banks licensed in Barbados. The goals of the Department are (1) developing legislation and regulations for the financial system; (2) inspecting financial institutions licensed under the Financial Institutions Act (FIA) and the IFSA to ensure that their operations are safe and in compliance with legislation; and (3) reporting on the performance and condition of each licensed financial institution. Barbados’ regulatory framework has been developed to conform with international standards and best practices, as contained in the Basel Core Principles for Effective Banking Supervision. In the past decade, an increase in cross-border expansion of regional financial institutions has occurred. In response, the CBB has improved its ability to supervise banks with cross-border operations, and to monitor risks on a solo basis and on a consolidated basis. To facilitate cooperation and information sharing, Caribbean regulators have signed a memorandum of understanding (MOU) and meet twice yearly as supervisory colleges of pan-Caribbean banks. The CBB continues to be an active member of other regional and international regulatory groupings, such as the Association of Bank Supervisors of the Americas, the Group of International Finance Centre Supervisors, Financial Action Task Force and the Caribbean Financial Action Task Force. Furthermore, the CBB continues to work closely with the other sectoral regulators of non-banking institutions that comprise the financial system in Barbados, and a domestic MOU has been implemented to allow for information sharing among domestic regulators. A large percentage of the banking institutions originate in Canada (more than 50 per cent of the five domestic banks and about 50 per cent of the 25 international banks). As a result, Barbados has developed a strong relationship with the Canadian regulators. In 2010, the CBB and Canada’s Office of the Supervisor of Financial Institutions (OSFI) signed an MOU to facilitate cooperation and information sharing, and the CBB visits and meets with the OSFI once a year. The CBB was in the process of implementing the Basel II Capital Framework when the global financial crisis emerged in 2007, and several later enhancements to the Framework were made. The implementation road map has been reviewed, and focus was initially on the implementation of Pillar II, which emphasises the importance of strong regulatory oversight and strong industry risk-management practices. The CBB’s implementation of the Framework has identified three phases and is continuing with the implementation of Basel II and Basel III. The goals of the Bank Supervision Department are facilitated through both on-site and off-site inspections of all licensed financial institutions. During an on-site inspection, bank examiners review the major areas of risk for the institution. The process includes assessments of liquidity, operational and other kinds of risks, fully recognising that the major risk on the bank’s balance sheet in Barbados is often in the area of lending. It is also recognised that any serious causes of banking problems are directly related to poor credit standards for borrowers, poor credit administration, and a lack of attention by the bank to changes in the economy and other factors that may affect borrowers’ ability to repay the debt. Bank examiners also review the strength of corporate governance within the bank. Under scrutiny are the structures and relationships through which the objectives of the entity are met, as well as a full assessment of the role of the board of directors, management of the entity, and the strategies, policies and practices that have been implemented. Inspections will also allow for an assessment of the internal control systems of the bank, a factor that is clearly critical for effective bank management and sound operations. Arising from the assessments undertaken, the examiner will determine areas of deficiencies. A report is prepared, detailing the condition of the bank’s operations and, where necessary, recommendations are made for improvement. The report is ultimately provided to the institution’s board of directors. Management of Barbadian banks is governed by the general rules that apply to the prudence and skills criteria of the business director and, by extension, of the corporate enterprise. Typically, banks will also have an audit committee, a risk committee, an investment committee and a human resources committee, depending on the nature of the business areas, risk profile and size of the bank. They are required to have scheduled quarterly board meetings at which reports on the various committees will be considered in detail. The audit committee will often be expanded into or combined with a risk policy committee. At its quarterly meetings, the board will also typically receive a report on capital adequacy ratios, a financial report, a credit portfolio report, a new and large credit review, a watch list of non-performing loans, and a Treasury interbank and country limits review. Other matters will also be considered, such as a litigation review. By virtue of the FIA, a licence is not issued to a commercial bank unless (in the case of a Barbados bank) the stated capital or (in the case of a foreign bank) the assigned capital is at least Bd$4 million. Banks must not have a capital adequacy ratio of less than the percentage as may be prescribed by the CBB and must be calculated as prescribed. A bank is also required to have a reserve fund and must transfer a sum of not less than 25 per cent of its net profits, prior to declaring dividends, each year whenever the amount in the reserve fund is less than its issued and paid-up capital. However, this stipulation will not apply to a bank that has satisfied the CBB that its aggregate reserves are adequate in relation to its business. The CBB may also require banks to maintain reserves for bad and doubtful debts of an amount that the CBB deems adequate. Under the IFSA, a licence may be issued to a company that accepts third-party deposits if the stated or assigned capital of the company is at least Bd$4 million and, furthermore, does not accept third-party deposits if the stated or assigned capital of the company is at least Bd$1 million. Additionally, a bank must always maintain a capital adequacy ratio of less than the prescribed percentage, which is currently 8 per cent. Assigned capital in this context refers to the portion of the capital of a company represented by such unencumbered assets as are approved by the CBB and specifically assigned by the company to its local branch operations. A bank is mandated to maintain a reserve fund and, out of its net profits each year and before any dividend is paid, to transfer to the fund a sum equal to not less than 25 per cent of those profits wherever the amount of the reserve fund is less than the stated capital of the licence, or indeed such other sum as is prescribed. Yet again, this requirement will not apply to a licensee that has shown to the satisfaction of the CBB that its stated capital and aggregate reserves are adequate in relation to its business. The CBB had previously indicated its intention to adopt the Basel II methodology for the calculation of capital adequacy in 2009 for licensees regulated under the FIA and the IFSA. As part of the process, the CBB issued the first round of guidance and reporting forms to the banking industry for comments and feedback in 2009. 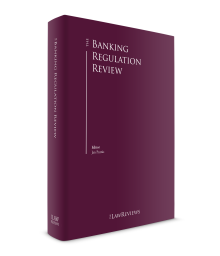 In view of lessons learned from the 2007–2009 financial crisis and the revisions to Basel II, and the emergence of Basel III, the CBB has deemed it prudent to adjust its approach to the implementation of Basel II. Papers issued by the Basel Committee on Banking Supervision (BCBS) and other entities that opined on the financial crisis have focused on the need to improve risk-management processes and techniques within the banking industry and to strengthen the regulatory framework. The importance of Pillar II of the Framework has therefore assumed special significance. In particular, ‘Enhancements to the Basel II Framework’ issued by the BCBS in July 2009 considered several of the risk-management weaknesses that were revealed during the financial crisis, and reinforced the ways in which banks should manage and mitigate risks identified through the Pillar II Internal Capital Adequacy Assessment Process (ICAAP). The CBB has issued a guidance note to banks indicating its expectation that they will improve and strengthen their risk-management processes. It indicated that the draft ICAAP guidance that was issued for comments should be used as a guide to banks. The CBB is therefore using a phased approach to the implementation. It is focusing initially on the qualitative aspects of Pillar II and, in that regard, on gaining a better understanding of the risk profiles of licensees. It has proposed an implementation of Basel II in three phases. Within the first phase, the emphasis will be on strengthening the qualitative aspects of Pillar II, while the second phase will take into account the implementation of the Market Risk Amendment. It is proposed that Pillars I and III will be implemented in the third phase. Phase I recognises the need to strengthen compliance with Pillar II by re-examining important risks and factors not covered under Pillar I, because Pillar II requires that banks assess the capital that is required to support all their material risks. Banks are therefore required to explore weaknesses and gaps in their risk-management framework and to use better risk-management techniques in monitoring and managing risks. The procedures used to remedy these areas are generally subsumed under the nomenclature of an ICAAP, namely, a process to more adequately link capital allocation to the risks inherent within a bank’s operations. During Phase II, the CBB proposes implementing the Market Risk Amendment. In this regard, banks will be required to implement a standardised approach for the calculation of the market risk capital charge. The CBB will consider use of the more advanced internal models approach after 2015. The third phase will involve implementation of Pillars I and III. The CBB’s Pillar III reinforces Pillars I and II by way of increased disclosure requirements that impose market discipline on financial institutions. Banks will be required to make core and supplementary disclosures, which will allow market participants to assess important pieces of information on the scope of application, capital, risk exposures, risk assessment processes, and therefore the capital adequacy, of the institution. Banks will also be required to publish information on their approach to risk management, thereby raising the overall standards of transparency within the jurisdiction. The CBB is also making amendments to strengthen the framework for Basel III. Hence, it is conducting an assessment and impact study of the additional requirements introduced under Basel III, such as liquidity requirements and the redefinition of regulatory capital. It will therefore amend the plan as deemed necessary. It also recognises that further changes to the framework may be required and has undertaken to consider the materiality of those updates on a case-by-case basis to determine their impact and applicability to the implementation process. It has assured the banking industry that it will be kept informed of any updates to the road map, and that the CBB will seek feedback and comments from the industry. The procedures for the resolution of failed banks are well documented through the interplay of the banking legislation and the modern corporate legislation that Barbados borrows from the Ontario and Delaware statutes. The jurisdiction has also benefited from very effective regulation and, as a result, has had no bank failures. In the case of the global Bank of Credit and Commerce International collapse in the 1990s, Barbados as a jurisdiction put together a rescue plan, as a result of which no depositors suffered, and the book of business was taken over by another banking institution. The conduct of banking business is governed by the applicable banking legislation and the many other statutes that govern areas related to fraud, criminal prosecution and the like. Similarly, precedent and case law in areas such as misrepresentation, negligence and confidentiality are fully entrenched jurisdictionally. The leading case of Tournier v. National Provincial and Union Bank of England2 is still relevant to the subject of the implied contract between the banker and customer. Hence, as in most jurisdictions, the Tournier principle has been modified by the plethora of anti-money laundering legislation, which imposes a countervailing obligation on the part of banks and financial institutions generally. In this regard, Barbados has both an Anti-Money Laundering Act and a Proceeds of Crime Act. To the degree that most of the Barbadian banks are subsidiaries or affiliates of foreign banks, the matter of funding will seldom raise a concern to be considered. Given the stringent requirements in the setting up of a bank, the matter of funding is a moot issue. The issue of individual control in banking business is not a matter likely to raise problems since all domestic banking institutions are generally owned and controlled by institutions, and are not closely held. As regards international (i.e., offshore) banks, the CBB has indicated very clear criteria that minimise the potential harm of any individual bank control. The CBB has identified four categories of acceptable international banks. First, it welcomes reputable, adequately capitalised and well-managed local companies with a proven track record. Second, it encourages well-established financial institutions or international banks, including branches or subsidiaries and affiliates of international banks or financial institutions, which have a proven track record and are the object of effective consolidated supervision. In the case of such a bank, the prior written outward authorisation of the parent supervisory authority is a requirement. Third, it has identified wholly owned subsidiaries of well-established international non-bank corporations with activities limited to intergroup treasury operations and with operations that are consolidated in the published financial statements of the parent company. In such cases, the issued bank licence indicates that the bank will not accept deposits from third parties. Finally, the CBB has allowed for banks where the beneficial ownership rests with individuals of high net worth. However, owners must submit an audited statement of net worth or other documented evidence that is acceptable to the CBB. In such circumstances, the banking licence is also granted on the condition that the bank will not accept deposits from third parties. However, the FIA states that no person shall directly or indirectly hold any significant interest in a licensee without the approval of the Minister of Finance. A significant interest is considered 10 per cent of the value of the capital of the licensee or 10 per cent of any class of shares of the licensee. Furthermore, each licensee must submit to the CBB at the beginning of each year a list of shareholders on its register who hold shares of a value of 5 per cent or more of its stated capital. Under the IFSA, no person shall acquire or hold shares of more than 10 per cent of the stated capital of an international bank without the approval of the Minister of Finance. A bank may transfer its banking business to another existing and licensed banking institution, or it may engage in the sale of its banking business simpliciter. the amalgamating companies’ draft shareholders’ resolutions or directors’ resolutions. Before the corporate amalgamation process is completed, the following additional documents are usually required: a copy of the regulatory approval from the CBB for the amalgamation, and a copy of the no objection letter from the foreign regulatory body in cases where the merging banks are foreign affiliates, even though they may be registered in Barbados as external companies to be able to carry on business locally. In the latter case, a sale of a banking business will also require the approval of the CBB and, in this regard, the buying bank will need to satisfy the CBB in many respects. First, it will need to be one of the four types of banking institutions favoured by the CBB and identified above. Second, it will be required to follow certain established procedures, which will vary according to whether it is a qualified foreign bank or, to the contrary, one of the other three types of applicant. a letter certifying the accuracy of the submitted information. The Barbados economy has been challenged during 2016 and 2017 with low economic and credit growth rates. There has been a lack of commercial bank credit demand, which has led to higher levels of liquidity. Our current financial system remains well capitalised while the overall economy is not performing well. Moreover, banks have managed to record strong profitability during this period thanks to the further widening of credit spreads and maintained high levels of liquidity. With the CBB sitting at the apex of its banking structure and regulating rigorously, Barbados continues to balance the needs of commerce and development with the requirements of business sobriety and holistic growth. 1 Sir Trevor Carmichael QC is the chairman of Chancery Chambers.